What is True Zero Waste? TRUE stands for Total Resource Use & Efficiency. This holistic approach to waste management involves considering the entire life cycle of resources to minimize waste. Not only properly diverting waste, TRUE looks to reduce waste production if the first place. Facilities and businesses can obtain a TRUE Certification by meeting the Green Building Certification, Inc. requirements. This symposium is a great opportunity to learn more about the certification process and get your questions answered. Who is Pursuing TRUE Certification? Business as big as Tesla, Inc. and small business all across the United States have obtained TRUE Certification. Check out how TRUE has made a difference for these companies! Sierra Nevada Brewing Co. is located in Mills River, North Carolina. 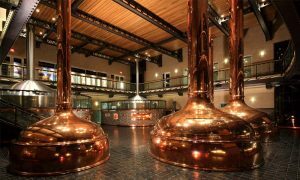 Since becoming certified, Sierra Nevada Brewing Co. has reached a diversion rate of 98.9 percent. This has lead to a net savings of $392,295 in just one year. Their strategy to reducing waste includes partnering with local composters to divert organic material away from landfills. They also utilize the rail system for product delivery to reduce CO2 emissions and work with their packaging suppliers to reduce waste. The Lundberg Family Farm has been producing rice and rice products since 1937. Their current diversion rate is 99.6 percent. Their zero waste program includes the recycling of materials that are both necessary for their work, but difficult to recycle such as uniforms, nitrile gloves, hairnets, and earplugs. They have also looked for ways to go paperless with electronic paystubs and billing systems. For more information visit the True Zero Waste Symposium web page or contact Stacy Albin, Environmental Program Coordinator at PRC at 412.488.7490 ext. 243 or at stacya@prc.org.